That’s what yesterday’s post was really about. What is the next thing I want to accomplish with my knitting? After reading your responses yesterday – and considering what I want to get out of knitting – I’ve decided that yes, it needs to be something wearable. Not necessarily every day wearable. But something I would wear at least occasionally. This is knitting – not needlepoint! I’m setting a goal of knitting a milestone garment by the end of the year. I’m not sure what it wil be. It might be one of the FIs from yesterday. Or it might be a Starmore Aran – I’m particularly fond of Cromarty and St. Brigid. Or it might be something I haven’t thought of yet. For the next few months I’m going to collect ideas. 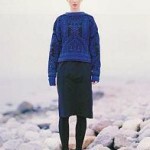 My plan is to start this garment sometime in September, with the ultimate goal of completing it by the end of the year. Until then, I think I’ll enjoy making some more simpler garments. It’s fun to see some projects come together quickly, isn’t it? 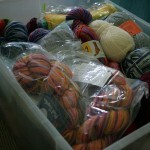 What are your knitting aspirations? Fair Isle. That’s my aspiration. Trouble is- I have to find a fair isle I’d wear. So far, Ingeborg is the closest. I do love Rachael’s Cromarty. Those cables just remind me of being in Ireland. But I have a passion for St. Brigid. I don’t know what it is about that sweater. It could just be the girl with the red hair–I have some serious red hair envy. 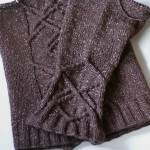 I did keep the pattern repeat the same on the Debbie Bliss cardi sleeves. I had already slightly modified the pattern for my colors and I couldn’t wrap my head around adjusting the sleeve change too. And I had a giggle imagining you climbing up on the counter. I wouldn’t have guessed you were 5’2″!